The U2 frontman was good friends with the late singer, who lost his battle with cancer on 10 January (16), and he has shared his memories of the 69-year-old in the latest issue of Rolling Stone. "I've played at being a rock & roll star, but I'm really not one," he confessed. "David Bowie is my idea of a rock star. Right now, I'm in Myanmar, a little cut off from the reaction to David's passing, but I can assure you the sky is a lot darker here without the Starman." The 55-year-old grew up with Bowie and became friends with the star after U2 hit the big time, and Bono credits David with introducing the band to many sights and sounds which influenced the group's music. "He came and visited us when we were mixing Achtung Baby - and, of course, he had introduced us to Berlin and to Hansa Studios," Bono continued. "We had a playful sort of banter - he would really go there in conversations, and we would even occasionally hurt each other's feelings." 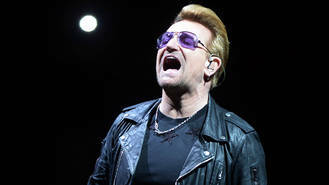 While the truth can hurt, Bono appreciated David's honesty for the most part, especially when it came to remarks he made about his Broadway musical Spider-Man: Turn Off the Dark, which he co-wrote with bandmate The Edge. "He took his daughter to a matinee, and he sent me the reasons he didn't like it," he recalled, "and everything he said was really helpful, because it was in the early days of the show." Like all David's friends, Bono was devastated to learn of his death, but he's glad he reached out to contact his hero on his birthday, just two days before he passed. "I sent him a long email, and I sent him a beautiful poem by Michael Leunig, called Love and Fear," Bono recalled. "One line goes, 'There are only two feelings/love and fear'. I didn’t hear back, but I was told he got it."